I have a little story for you today. It's a story that began in February shortly after I began this blog. It's a story of our dining room table, and a little bit more. It's a story about making the best of what you have, even when what you have is a really crappy table. Let's start at the beginning. When we first bought our house two years ago, we had a very small budget to furnish it. The budget was so small that after purchasing two couches, the budget turned nonexistent. I loved it at first, but I quickly grew to hate it. Some people have actually pinned this picture when I used it in previous posts, but every time it's pinned, I cringe. I assure you that the picture does it WAY more justice than it deserves. It was really ugly in person. The veneer began to peel off of the top, it scratched easily, it was HUGE, and having to make our guests inch around this gigantic table just didn't work. So, after about a year of giving it dirty looks every day, I resold it on Craigslist. I've found that when you buy stuff secondhand, you never feel guilty or bad when you realize the purchase was a mistake. You just resell it and move on. My plan at this point was to find a smaller round table somewhere locally and then find chairs I loved online. I found this for $30. This is the picture that was on Craigslist. That is NOT my garage. My garage is much grosser. From the picture it looks all glossy and in great condition. I knew I would be painting it anyways, so for $30, it passed the test. Well, when Jesse brought it home, I about fainted. It was the most banged up, beaten up piece of wood I had ever seen. But, again, since it was $30, I figured I'd give it a go. My first plan was to stain it with a grey wood stain, but the veneer was so damaged I had to paint it instead. So, I painted it a beige-gray. I left it this way for 4 months. Be kind to me....I never planned on showing you these pics, fearing that my table-adventure was a flop. During these 4 months of my beige table, we never had chairs. It was simply a time where we had other priorities than assembling our dining room. The cats were the only ones who seemed to like it. They perched on it all day and looked out the glass doors. So, since then I've decided just to sell it. It's just not the right table. But, before I sell it, I needed to figure out what color would look better in this space: a rustic, raw wood table or a black table. I'm still so torn, as both would probably work well. So, I decided to paint the $30 table black so that I could stare at it for awhile and remember how a black table looks in our house. So, I spent a few evenings sitting on the floor of my bedroom painting the table black. 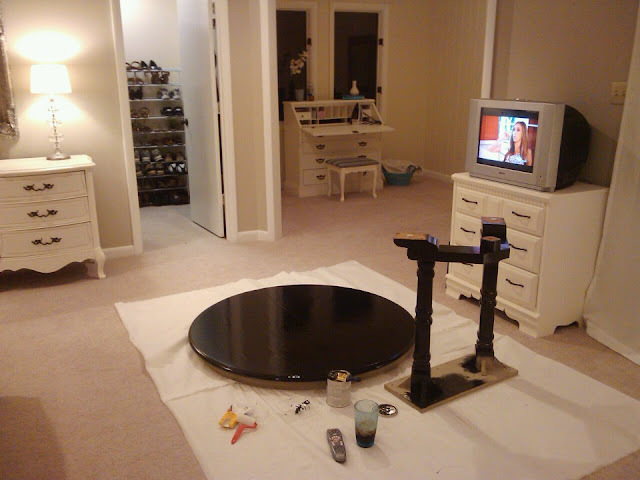 You probably think I'm crazy, (and I suppose I am) but I like to paint furniture right here while I watch TV. This pic was taken while it was drying...there were about 4 more dropcloths laid down while I was actually painting. I really debated on whether or not I even wanted to share this project, because my dining room is still SO unfinished. I brought in the office desk chair for the pictures, just so that it didn't look so empty. Here's the 'finished' table. I like the black table! It really looks pretty in your space. The rest of your room frames it and it seems to be a focal point! I mean it's been a lot of different looks and you still only have $30 in it....wait, I'm sure you bought paint, but still....why don't you wait until you get those hardwoods and then get a rustic table! I think you can sell that sucker for more than $30 right now! On the thrifty rustic side, you can use pallets to make that farm table! If you are like me.....you are constantly wanting to change! Fun story and I'm glad you shared lots of pics. I fear posting "not perfect" photos and therefore do not post often! I like it! And, I like your new header too! Good work all around! Why, thank you, Mrs. Cyclists Wife!!! Muah! You have a real gift with words. I appreciate how open and honest you always are. That said, I like the shiny black. The raw wood is nice, but I know that I would get tired of it after awhile. The black is classic and allows more interesting chair combinations. I just bought (and by "I" I mean my parents bought it for me for Christmas) a wood table with black chairs so I can get a little bit of both. Just knowing the way you usually decorate, I think you'd do amazing things with a raw wood table, black always works though. I went with a wood table knowing that I can paint it at any time if I get mad at it and want to change up the look. On a side note: Why does your scrimping and being creative and finding solutions and all that look so dang polished? I'm impressed! hahaha! Courtenay, I have no answer to that question, as I am often unsure whether my scrimping produces anything even slightly polished!!! :) But, thank you so much for saying that! Hmmmm....now I need you to share your secrets on how to get someone to gift you a table for Christmas!!! ha! Thanks for your thoughts!! I am in love with rustic/raw wood looking furniture lately. It's very versatile. You can make it feel like country or shabby chic or very elegant just by adding different accessories. hahahaha!! I love the last suggestion. Do I hafta build a table? Can I just call it quits today and hibernate through the winter? Okay, but really....I LOVE Ana White, too. The only problem is convincing a)my husband to build a table or b)me to use a power tool. Neither is likely to happen, but I'm pushing for #1. Also, I LOOOOOOVE this one: http://ana-white.com/2012/11/plans/farmhouse-table-updated-pocket-hole-plans That would definitely be IT if I build one. Thanks Anne! I like the black and I LOVE that table. Total steal for $30! And I salute you and your frugal ways! We are no-loan no-car-payment forced-patience people too. It definitely inspires creativity! I am totally in this same dilemma with you! We have such a small dining room and I kick our dining table every time I walk by it too! On purpose and accidently! ha! We have a black table in the kitchen and I keep thinking I want to change to a more rustic wood table and then... well, you know how it goes. I like the black table! But for the space, I'm completely with you on the oblong table. I think if it were me, I'd stick with the black table for now until you get your floors done and pick out your fav rug! That could make a world of difference and if you are like me, you may change your mind between now and then... like I do a meeeeelion times! :) I can really appreciate your story and sharing the imperfections with us too. Thanks for keeping it real. Thanks so much Ellora! You make me happy I kept it real! :) I so agree with you, too...I think I will end up keeping it as-is until we fix the floors, as I'm sure I'll change my mind a million more times before then! Glad you can relate!! Thanks so much for your sweet words and for sharing your thoughts!! i love the black! i think it totally anchors the space!!! Love it, keep the black! Its different and makes the table look beautiful! Well, thank you, Pamey!! You are a sweetie! Thanks for sharing your thoughts! The black looks really great against the other neutral colors in this area...but I have to admit I'm more of a rustic wood liking girl myself :o) I think you can't go wrong either way! Personally i think black would anchor the space nicely since everything else is so light and airy. I madeover a CL table into an espresso and i am so happy with it. I agree that since you havent paid a ton of money, switching things out is easier. Me and my hubby are experiencing the same limited budget and we have to be creative as well. Love the post! I say black! It really stands out, it doesn't get "lost" like when it was white. Plus if you're re-doing the floors in a dark hardwood, the black table would flow more with the space. ...and since I took to heart " if you prove your allegiance, your opinion counts", I'm gonna jump in and say RUSTIC RUSTIC RUSTIC! Plus the cats can scratch it and it will just get BETTER that way, yeah? I loved reading about your table saga. I think if you love a rustic wood table, that is what you should try to find or recreate. Anything else will leave you feeling unsatisfied. I like the black table in the space you have now, but agree that once the dark hardwoods come in, a rustic table would probably work better. I also like the idea of a long, skinny table in there. There are a few lovely homemade farm tables on Pinterest (such as the one from Domestic Imperfection) that are gorgeous and amazingly inexpensive; perhaps you could adapt one of those patterns and get your table sooner than you thought! OK...About the table. As is in black, I think it works exceptionally well with your existing things. I wouldn't be too concerned at this point about what you'll get/find after you put down dark wood floors. That's a ways off, according to your plan ;-) So the thing is to make the table work now. Your entire "look" is basically clean/streamlined and chic. Although I too love RH tables, that might be the "odd man out" with your furnishings. That's not to say it wouldn't look fabulous! Sometimes that one thing that's different is the greatest thing in the room/home! I love the contrast of the light and dark in the room, it gives an expensive weight to the light room. I think the black table is rich looking, since you'll still be using a area rug after you change to hardwood, you're really just adding another texture which gives the room more dimension. I think your on the right track ! I would still love the linen covered chairs. By the way, much like you I have the same shaped dinning room and I've been through 3 different shaped tables. I started with square (yuk), then long rectangle (not pleasing to the eye), I settled on a round it is not only pretty it really turned out nice for dinner conversation and gave me the room for a small buffet. A plus for this scenario is since your table is already there and paid for... you could really get beautiful chairs. Either way your home is just lovely and you'll undoubtedly do a beautiful dinning room as well. No more kicking tables, it's really hard on the toes. Thanks for sharing your adventures in deco on a budget ! I'm going to throw you a curve ball and say that with dark hardwood (we just put it in last week) neither the black or the other finish you talked about may make you happy. I left my round really dark table in the garage (I need the same table you need) and am contemplating a white farm table. Looking forward to what you decide. I'm tired of trying to figure it out, so I might just go with whatever you do! I love the black table and I love your blog!! I just got a second-hand round table and painted it white and am wondering what finish you used on your table? I have a can of Minwax polycrylic that I was planning to use...what do you think? Do you think that hold up to daily use, or would you recommend something else? thanks!! I love the black table!! 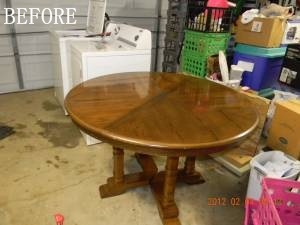 I am about to re-do our dining table and chairs and wanted to know what kind of paint did you use? Do you mind sharing what black paint you used?